Kids are scary! And they scare easily. Get both sides of the situation with the cutest versions of Groot and Rocket Raccoon that you've ever seen! 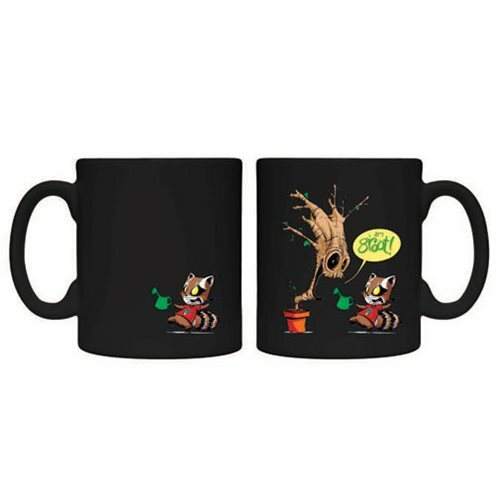 This Guardians of the Galaxy Water Heat Change Mug features an image of Rocket Raccoon teetering back while holding a watering can when the mug is cold, but get the mug hot and an image of potted Groot shows up where he's yelling, "I am Groot!" at a frightened Rocket Raccoon. Hand wash only. Not dishwasher safe. Do not microwave. Ages 13 and up.